Satisfy your cravings with this comforting, hearty meal. 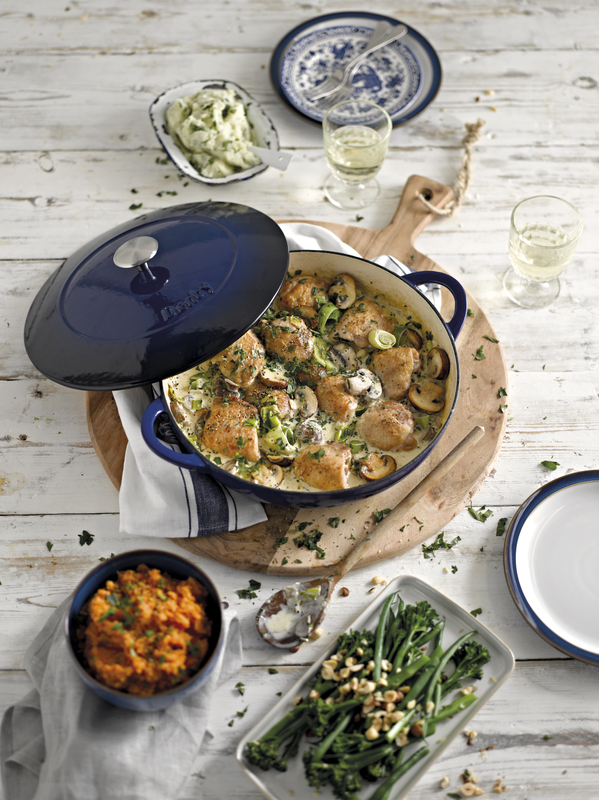 Heat the oil in the Denby Shallow Cast Iron dish and add the chicken pieces skin side down. Fry for a few minutes until golden then turn and seal the other side. Turn down the heat and cook for a further 5-10 minutes depending on size, until just cooked through. Remove from the pan and set aside. Alternatively, seal in the pan then transfer to the oven for 10-15 minutes until cooked. Meanwhile make up the stock with boiling water. Add the butter to the dish and fry the leeks and mushrooms for a few minutes until lightly golden then add the garlic and fry for another minute. Pour in the white wine and bubble for a minute then add the stock. Return the chicken pieces to the pan, season well with black pepper and allow to heat through. Pour over the cream and herbs and bubble gently for a few minutes until slightly thickened. Garnish with a few extra chopped herbs scattered over the top and serve with mashed potatoes, mashed sweet potatoes and steamed green vegetables.